During an interview this weekend with 60 Minutes, Pelosi was asked about the Progressive wing of the Democratic Party, and specifically Alexandria Ocasio-Cortez. Pelosi quickly interrupted the interviewer to say that the Progressive wing was “like five people,” leading to a lot of anger on the left. This anger is justified and Pelosi needs to understand that the country is changing and she either has to adapt or step out of the way. Ring of Fire’s Farron Cousins discusses this. Well, Nancy Pelosi certainly stepped in at this past weekend during an interview with CBS 60 minutes. We’re, she was asked by Leslie Stall about the, uh, progressive wing of the Democratic Party in Congress to which Nancy Pelosi immediately interrupted instead. That’s like five people. She was asked specifically about the progressive wing of the Democratic Party in Washington DC being led by Alexandria Ocasio-Cortez. That is what Leslie Stall said. 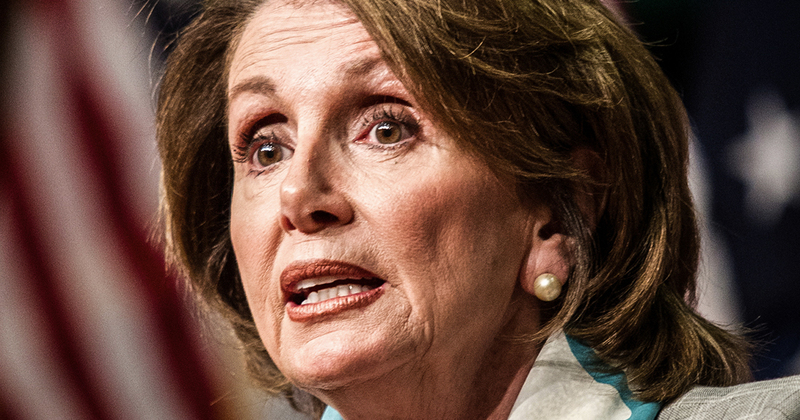 And Pelosi immediately interrupted and said, that’s like five people trying to undermine her own colleagues that are supposed to be on the same side of the aisle as her trying to undermine the very people who have already shifted the entire narrative in DC because she doesn’t want to piss off her donors. That is what this was about. That’s why she is belittling these members of Congress. And one of whom, by the way, representative Ilan, Omar getting death threats on a daily basis at this point, because of the attacks from Donald Trump and Pelosi just decides to write them all off. It’s like five people who cares, right? You know what? First of all, it is more than five people. But second of all, if it even was just five people, you should be impressed by the fact that these five people have already changed the way things work over there on the democratic side that these five people are already pushing policies and even legislative packages that a majority of people in this country seem to support at least polling data shows that they support it. And that point is even more important when you think about something Pelosi said later, which was this by and large, whatever orientation how’s Democrats came to Congress with, they know that we have to hold the center, that we have to go down the main stream. You know, stay right there in the middle. Don’t do anything too good. Don’t do anything too bad, just right down the center where you basically do nothing at all. And you still get attacked by Republicans for being socialists. What’s the point, Nancy? You know, when Democrats were, he took the house and I’m sure everybody remembers this, the end of December, uh, everybody was talking about Pelosi needs to be challenged for the speakership. And you had a lot of people, including some progressives who said, no, hell no. Let’s let Pelosi take it. Plus he knows what she’s doing. Pelosi is a good person and it took a few months, but man, if Nancy Pelosi is not showing her true colors right now by attacking her own colleagues, colleagues who are just trying to help American citizens. That’s literally what they’re doing. I hope everybody understands that of it. Medicare for All their push for Medicare for All, that’s not because they personally get something out of it. It’s to help American citizens. The green new deal is not because they’re being funded by big green new deal. Okay. It’s because they want to have a habitable planet for themselves and for their kids and their grandkids and their neighbors and their friends and their parents and everybody else on the planet. There is no ulterior motive here. They’re doing this because they care. People elected them and got rid of Corporate Democrats to elect them because they care. Nancy Pelosi does not, and you can argue with me on that point, but her statement over here proved it. We have to hold the center. Where have you been the last 10 years, Nancy? When has holding the center ever worked out? Well, for the American public. Did FDR hold the center? Did Martin Luther King hold the center? No. They knew they had to get radical if they wanted real change to happen. And that’s what we have to do right now. So if you want to hold the center, that’s on you. But I can promise you a majority of people in this country, which includes a majority of Republicans, actually support the things that these five Democrats are trying to put out there into the ether. So if you want to hold the center, I hope you understand that the center has shifted very far to the left and your the one who’s considered outside of the mainstream.